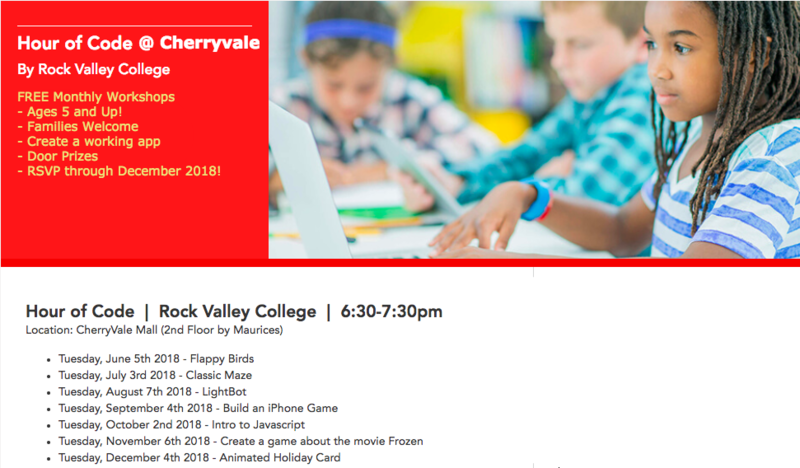 What is the "RVC Hour of Code"? The FIRST “Hour of Code” event at Rock Valley College was on December 12th, 2015. The event brought 126 people from the Rockford Region to learn more about Computer Science fundamentals and coding! 765 people from the Rockford region have attended and completed the “Hour of Code”! Everyone should learn basic coding skills! Every industry is driven by software and every employee uses software to conduct daily tasks, Having an understanding of coding is vital to not only working with software but also critical thinking. "What inspires me to continue teaching these sessions is to see entire families attend and spend time together with technology which many times separates families. In addition, opening the door of coding for many young people to enter into is also very satisfying. Only 1 in 4 K-12 schools offer any type of computer science course and the need in the marketplace for skilled programmers will only increase."